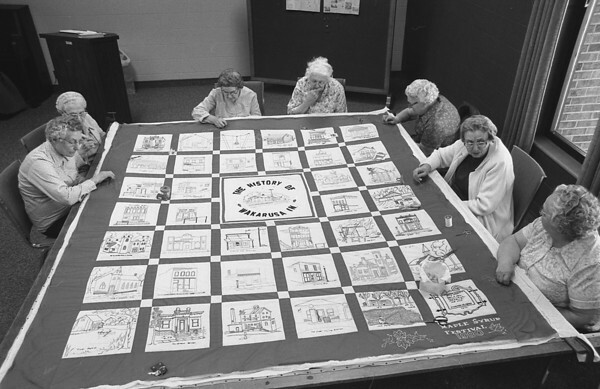 Members of the Wakarusa Historical Society are making a quilt with pictures of the town's history sewn into the squares of the donated material. The project is planned to raise funds for the town's museums. Mary Ann Troxel sketched all 38 small blocks and the large one in the middle and ladies of the community embroidered the blocks, finishing last month. Everyone is welcome to help stitch the quilt in the library meeting room through Feb. 16. The work will be displayed at the library until it is sold through bids March 29. Pictured above, clockwise from left, are Minerva Overholt, Inez Eby, Frankie Myers, Marie Chupp, Hazel Dils, Jay Freed and Grace Flory.